I have great plans for jsTIfied, including letting you somehow test programs from the archives, run SourceCoder projects, and much more straight from your browser. Before that can happen, there are plenty of tweaks and changes for smoothness to be made and features to be added, so for now, enjoy the screenshots below! That's some high level of awesome right there, Kerm Good job, can't wait to see this working in conjunction with sourcecoder! Many thanks, tifreak8x! I'm looking very forward to sharing this with everyone. This is very cool! Do you have plans to support 84+ emulation as well? Thanks, Elfprince! I am able to eke out about 8 or 10MHz, so there is a bottleneck there. I also don't think I'll be able to fit a full 84+/SE OS in the DOM Storage, although I'm not positive about that. Awesome job, Kerm. Do you have plans to let it directly connect to gCn without any offline computer programs? Oh a, I didn't even think of that, but I absolutely want to implement that now that you mention it. Thanks for a superb suggestion! Only thing free and open is the Bootfree bootloader. Still iffy ground. Don't most browsers allow you to configure DOM Storage allowances on a per-site basis? Safari has a "X MB Database Storage Allowed Before Asking" in the preferences, where X defaults to 5. Yeah, that's my view as well. I'm happy letting users worry about the ROMs they have on their own computers and not having them touch the Cemetech server at all. I actually got the DOM storage of the ROM fully-working; next up is serializing and de-serializing the ROM, RAM, and CPU state into and out of DOM storage so your calculator's state persists. Interesting work, Kerm, I look forwards to seeing how it pans out. I hope you're testing in multiple browsers too to avoid relying on any browser-specific quirks, flaws or "features". I wonder what the legality of creating a completely home-brew OS that exposed (most of) the same bcalls as the official TI-OS would be? Most assembly games use a very small portion of the OS, so it wouldn't seem a particularly daunting task to get a large number of games running (you could boot the emulator straight to DoorsCS) and if a program did invoke an unimplemented bcall you could catch that, display a meaningful error message and offer to send a report to the emulator author. This looks pretty cool. Can't wait until it's testable. I would very much like to do so. I hope it will be especially helpful to people like you who like to code up programs in SourceCoder and don't have access to a cable to load your programs onto your calculator for testing. I have not started doing so, but I absolutely hope to. I'm trying to go for a minimally-kludgy approach to all the JS coding in this (and the HTML, for that matter). 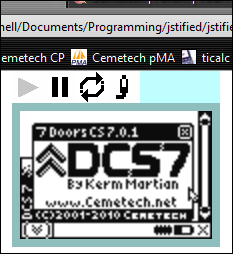 I'm going to be opening up a semi-private beta much sooner than expect, so I'm hoping my favorite Cemetechians will assist me in cross-browser testing. Thanks for your help in finding those two bugs this morning! It's certainly something that I've considered before, mostly as a real calculator OS. In the end, I decided that the number of support systems and routines would make it infeasible to the point where I would essentially be duplicating the OS, save perhaps some of the math functions. I would gladly help cross browser test that for you! 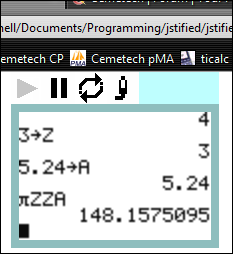 Also another, cool quirk you could add, not sure how feasible it is.. Link the calculator to the archives at cemetech.net and ticalc.org, and make those programs testable. I have hated downloading games that I did not like, especially since Ti Connect and TILP dont like me. It would be nice if you could test the game to see if you like it, then download it for personal use. Not sure how possible that is however. I have great plans for jsTIfied, including letting you somehow test programs from the archives, run SourceCoder projects, and much more straight from your browser. That's way farther down the line for this particular project, though. That's a planned feature, Aes_, that was stated in the original post. Not sure if ticalc.org is in the works, but the Cemetech Archives certainly are. That would make it an amazing emulator online or offline. Maybe sound too? Though that would be much harder I'd imagine. That would make it the best emulator online or offline. Maybe sound too? Though that would be much harder I'd imagine. Sounds would be very very hard. Linking/gCn is hard enough; I have to decide whether I'm going to be cheap and do direct memory injection, or actually do a state machine and play with the link lines. Actually, what about putting Cemetech- and ticalc.org-archive-browsing features in Sandpaper (those were planned, right?) so you can use it with gCn in jsTIfied? That way you won't have to make a separate system for browsing those files. There are 116 users online: 2 members and 114 guests. © Copyright 2000-2019 Cemetech & Christopher Mitchell :: Page Execution Time: 0.194200 seconds.